Relocating to Italy for work might not be such a good deal for Bangladeshis, says a report on the social impact of migration in Bangladesh to be released on 31 October. “Migrants who have left recently have not been able, so far, to establish themselves in Italy in terms of finding a viable living in either business or employment… let alone remit money home,” said Nicoletta Del Franco, who carried out the study in Brahman Baria Sadar, eastern Bangladesh. Commissioned by Terre des Hommes Italia (TDH), facilitated by the WARBE Development Foundation, and funded by the European Union, the study focused primarily on families affected by a new trend of migration from Bangladesh to Italy, the second most popular destination in Europe after the UK. “Migration has long been an important livelihood strategy for the people of Bangladesh. Though most attention is devoted to remittances and their uses, it is also important to promote migrants' rights and look into the situation faced by families who are left behind,” said Patrizia Gattoni, TDH country representative in Bangladesh. According to the Italian Bureau of Statistics (ISTAT), around 70,000 Bangladeshi's are regularly residing in Italy; a number which doubles if you include those who arrived through alternative methods, according to an estimate of the ISMU Foundation. The research shows some migrants pay up to $20,000 to different kinds of intermediaries with a promise, not always fulfilled, of obtaining proper documentation and a job, often as a labourer. Others take higher risks by trying to enter through irregular channels for up to $10,000. As a result, only relatively prosperous families can support the huge cost of legal migration, which typically requires borrowing a large sum of money. In the current financial environment, the traditional method of sending money home to pay off this debt and supporting the family is becoming less feasible, leading to more and more stranded migrants, some even needing relatives in Bangladesh to support them financially. Families with inadequate savings run the risk of losing their land, putting pressure on the women and children to provide economic support. “The report highlights the need to create safety nets for parents, wives and children to [help them] face possible situations of economic difficulty... [and] find ways to raise awareness of the potential hazards of migration,” Del Franco said. 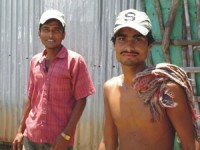 Another research paper to be released simultaneously looks at Bangladeshi migrant workers in the Italian labour market. In 2009 Bangladeshis working overseas sent back more than US$10.7 billion, according to the International Organization for Migration - more than the total amount of international aid to Bangladesh. The total number of Bangladeshis - both legal and illegal - in Italy is over 135,000, according to the ISMU Foundation, an independent organization promoting research on multi-ethnicity. Source: IRIN, the humanitarian news and analysis service of the UN Office for the Coordination of Humanitarian Affairs.